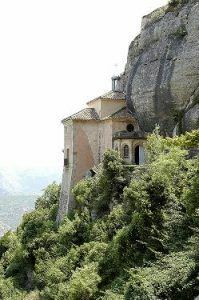 The Sanctuary of Montserrat is nested in the middle of the most emblematic mountain in Catalonia. More than two million people arrive every year at this place. The existing devotion for Virgin of Montserrat, together with the singularity of the surrounding area and the cultural importance of the monastery make Montserrat a different place. But Montserrat is not only a place conceived for and to pilgrims. On the contrary, it was conceived for everyone wanting to visit it. A characteristic that makes this Marian destination different is the fact that Montserrat is not only a sanctuary, but a monastery and a mountain. According to legend, on a Saturday of year 880, some young shepherds saw a big light coming down from the sky. It came accompanied by a beautiful melody. This scene repeated itself in several occasions. Finally, the bishop wanted to see it with his own eyes. He went there and saw the same scene and when they tried to move the image of Virgin Mary, it become impossible. They understood the divine will: that image had to be venerated on the Montserrat Mountain. 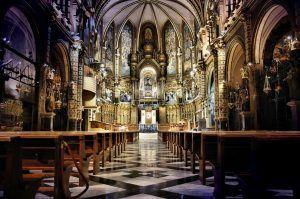 The first document that mentions something, therefore, the historic origin of the sanctuary of Our Lady of Montserrat is from year 888. Count Wilfredo ‘El Velloso’ donated the hermitage of Saint Maria to the Ripoll Monastery. Very soon, this small abbey received pilgrims and visitors from many places. Every body knew the stories of the miracles that there the Virgin did. Some years later, a Romanesque church was built and was sculpted the image of the Virgin, the same one that is venerated today. 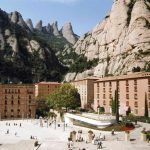 Montserrat is a big space where the visitor can enjoy the basilica, the place where the image of the Virgin is kept, the natural park, the monastery, the kids choir and the museum. Montserrat is not only a place conceived for and to pilgrims. On the contrary, it was conceived for everyone wanting to visit it. A characteristic that makes this Marian destination different is the fact that Montserrat is not only a sanctuary, but a monastery and a mountain. The basilica was originaly built using the Renaissance-Gothic stile. The Catalonian architecture applied these two styles during the 16th century. The moment you enter, the first thing that you can see is the monks´ choir and the main altar. On the top part, you can see the throne with the image of Saint Mary. It has only one nave with communicated chapels and side platforms. It is not a church of big proportions, even though if we think of the time, the place where it was constructed and the available materials, it looks like at that time it was quite a building. The environment gives and ambiance of intimacy and meditation . In order to venerate the image, you will have to exit the basilica and get back in through the right side entrance. The ritual gesture used to venerate the image is kissing or touching her right hand . This hand holds the ball that symbolizes the universe. When going down from the Virgin´s throne, you will see the “camarín” (small chamber) of the Virgin . This space was design by Master Francisco de Paula and assisted by the young architect Antonio Gaudí. The organ deserves a special mention. Montserrat has always been a music reference in Catalonia. The organ that can be heard nowadays has 4,242 tubes. 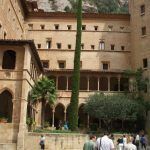 The Benedictine monastery, founded by abbot Oliva on 1025 is one of the institutions that give Montserrat its own personality. Approximately 70 monks dedicate their lives to work, prayer and to the welcoming service of pilgrims and visitors. The goal is to make Montserrat a prayer and meeting place. The main activities of the monks are the organization of the monastery and the sanctuary services, research and teaching, popularization of studies and training the choir. They dedicate their lives to prayer, work and to providing a warm welcoming to pilgrims. The library of the monastery has played a fundamental role in the preservation and popularization of the Catalonian Culture. It has more than 300,000 books and volumes. – the Plaça de Santa Maria, the closest to the basilica. In this one are celebrated different acts many Sundays and holidays. The Virgin of Montserrat, popularly known as “La Moreneta” (the little dark-skinned one) due to the dark color of her face and hands, is a 12th century Romanesque carving of great beauty and expressiveness. It represents Saint Mary as “God´s Mother” or “Knowledge Throne”. The color does not come from the wood (it is not dark) or the paint. There are historical testimonies that indicate that the figure has been slowly darkening with the past of time. The image follows the “Virgin on its Majesty” standards, showing Virgin Mary in a frontal position with Jesus sitting on her lap. As an expression of the veneration to the holly image, pilgrims and visitors touch or kiss the right hand of the image. As a result, this right hand has partially lost the original color. Despite of the successive ups and downs, and vicissitudes suffer by the Holy Image (wars, fires, revolts…) has managed to escape undamaged. This was possible thanks to the care and safeguard taken by the monks. These and other moments in history have made the Virgin of Montserrat one of the main symbols of Catalonia. She has a very relevant place in the history of the Catalonian people. The image was crowned patron saint of Catalonia on 1881 by Pope León XIII. 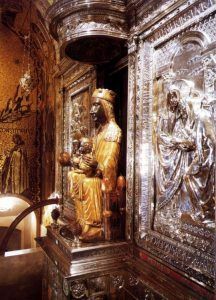 The image is placed in a silver altar piece (paid by the donations of the people) and it is in this place where she receives the daily visit of thousands of pilgrims and faithful. – Orient Biblical Archaeology: objects representing the cultures of Mesopotamia, Egypt, Cyprus and Palestine. – Modern paintings and sculptures from the 19th to the 20th centuries. 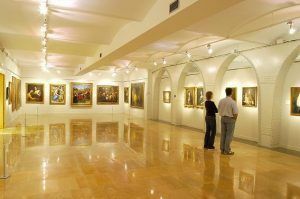 It includes pieces of artists such as Dalí, Monet, Sisley, Degas, Pissarro, Chagall, Le Corbusier, Miró, Picasso or Tápies among others. 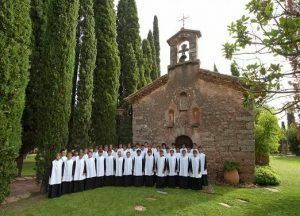 From monday to sunday: from 10.00 to 17.45 h.
The ‘Escolanía’ (kids´ choir) is one of the most emblematic institutions of Montserrat. Created in the 14th century, from the beginning and under the direction of the monks, it has been at the service of the sanctuary. Therefore, the “Escolanía” is one of the oldest music schools in Europe and that remains open. With up to 50 boys on school age, the choir sings every day in the basilica, participating in the liturgical celebrations. From Monday to Friday, the “Escolanía” sings the “Salve” and the “Virolai” at 1 pm and the ‘Salve Montserratina’ (anthem of Montserrat) at 6.45 pm (alternating polyphony and Gregorian Chant with the monks choir). On Sundays at noon they are part of the convent mass. From Monday to Friday: from 10.45 to 13.00 h. and from 19.30 to 20 h.
Saturdays: from 10.00 to 13 h. and from 19.30 to 20 h.
Confessions: from 8 am to 13 h., fro, 17.15 to 18.15 h. and from 19.30 to 20 h.